This post is sponsored by Mattel. All opinions are my own. Are you ready to “Raise Your Voice” with Barbie™ in Rock ‘n Royals Movie Popcorn Party? My girls could not wait to pre-screen this all new musical! 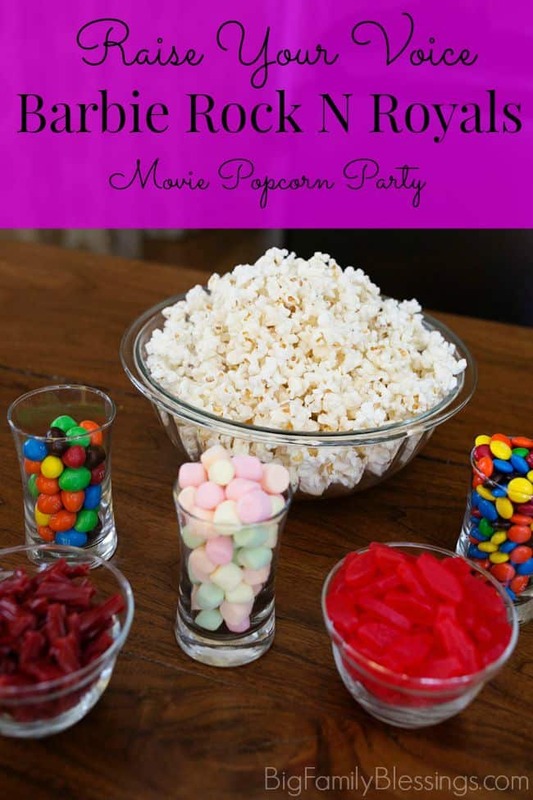 We’ve had a very busy few weeks, so the girls and I planned a Barbie in Rock ‘n Royals Popcorn Party, looking forward to vegging out with Barbie and some yummy snacks! Let me tell you, we were not disappointed! This all new musical stars Barbie as Princess Courtney, who accidentally ends up at Camp Pop (for rockstars) rather than Camp Royalty. Meanwhile, famous rockstar Erika ends up at Camp Royalty. When it takes several days for the rival camps to correct the switch, Courtney and Erika begin to enjoy their time in the wrong camps, learning new things about themselves and making new friends along the way. Eventually the girls work together to try to save the struggling rival camps. What could be better than princesses AND rockstars? Within minutes of beginning the movie, my girls were riveted. The story as well as the music and dancing pulled them right in. I also enjoyed the story, but as a Momma, what I really LOVED were the messages I heard: that it’s okay to be different, that you should fight for what is important to you, that hard things are worth doing, and that teamwork makes a difference! I definitely recommend getting a copy of this movie and enjoying a popcorn movie party with your girls. 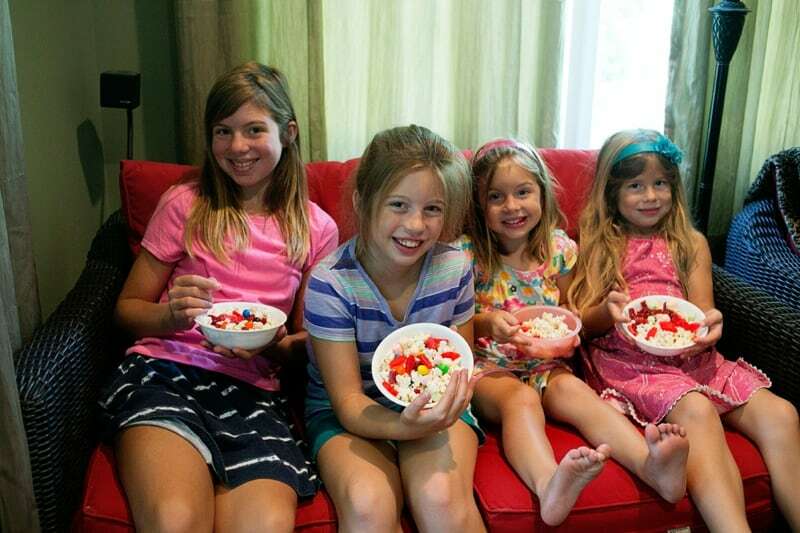 We love adding mini marshmallows, M&Ms, and our favorite chewy snacks to our popcorn for special movie nights. Not only will throwing a party and watching this movie with your girls be a fun evening, but it also provides a great opportunity to talk about daring to be different and raising your voice with confidence with your daughters. After viewing this movie, my children spent the rest of the weekend playing rockstars and princesses. In fact, they loved the movie so much that we watched it again the following day – and everyone was still just as entertained the second time around! 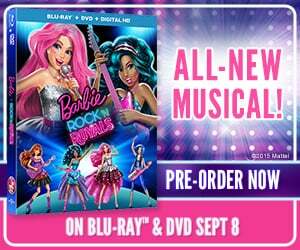 Pre-order Barbie in Rock ‘n Royals here! Barbie POPCORN?!?!?!?! UM, sign me up because right now I am craving my YOUTH! ;) -- Well I mean, when I was like 10 and nothing mattered! That's a nice spread you put out mama! Is that Swedish Fish I see? YUMMY!! I love those things so much!lol Sounds like a great movie and it looks like your kids had a great time. It is! We love swedish fish too! This movie looks like something my daughter would have loved! I think the idea of creating your own popcorn mix is so fun. 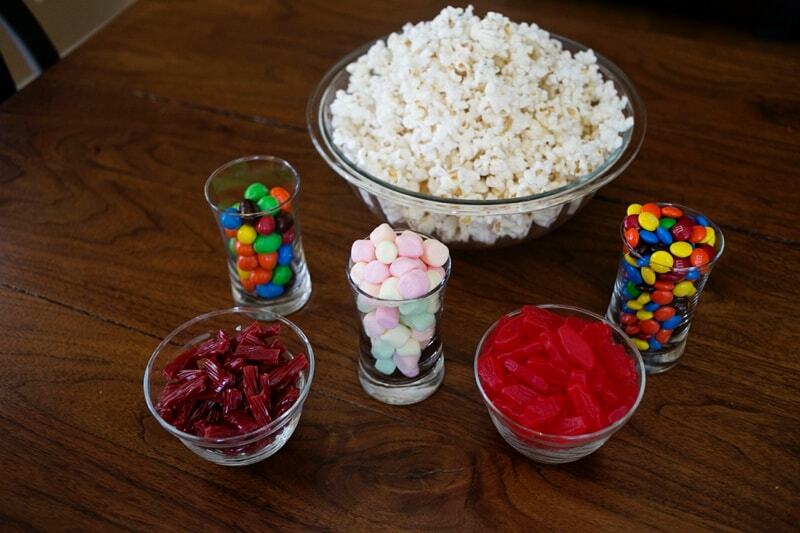 I will have to try it at my next movie night! What a fun medley of snacks. I will have to try this for our next move night. I think the kids will love it. My daughter loves all things Barbie and is looking forward to watching Rock N Royals. This sounds like a really fun theme! 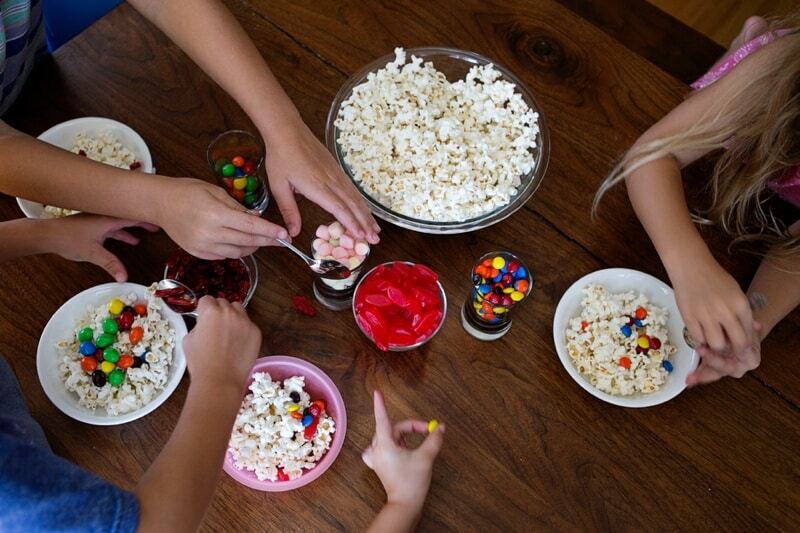 The kids must've had a blast adding their own treats to the popcorn. 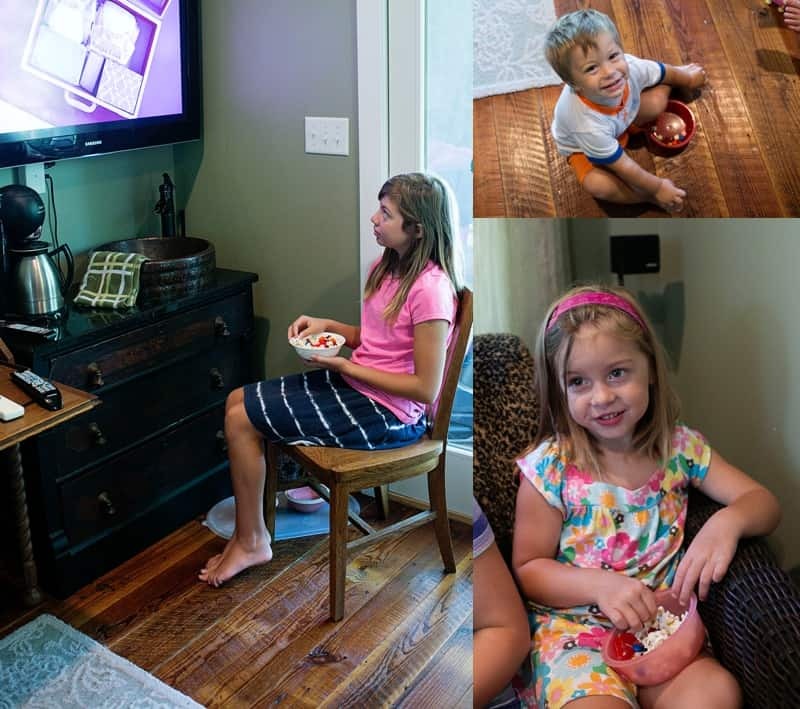 I love that you brought the fun and excitement of going to a movie theatre home. The snack set up is so cute and I bet my girls would love to see the movie too. What a great lesson to learn especially with school starting and making new friends.